If you ever need to bring down hung-up trees, pull out-of-reach logs, get a vehicle un-stuck, or find yourself in any other similar situation, the PCW5000 winch is for you. This winch is powered by the HONDA 4-stroke GXH-50 cc engine--it is designed for heavy loads! 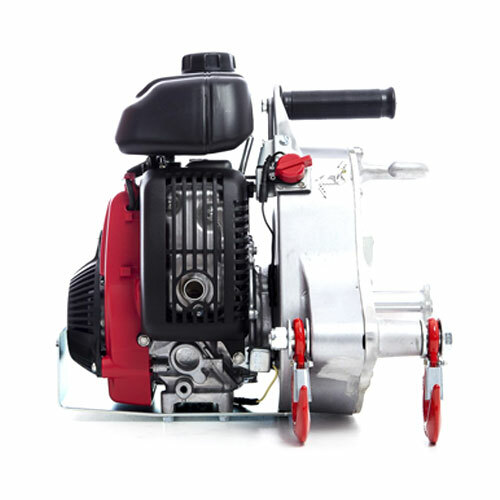 It also has an impressive strength-to-weight ratio, weighing just 16 kg, yet offering a pulling force of 1000 kg. 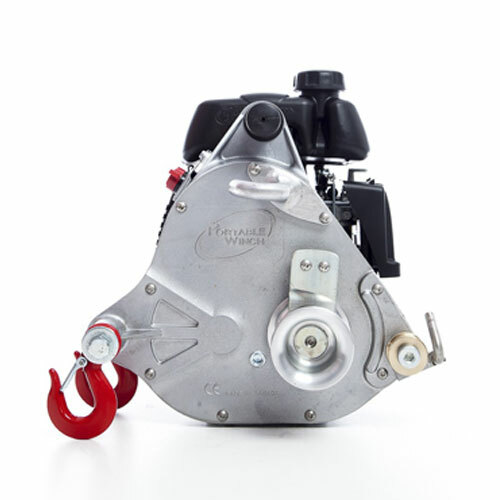 In addition, you can order optional drums to change the pulling speed of your winch. The standard configuration is the 57 mm drum, which is designed for power and pulls 12 meters per minute. But you can also order separately the 85 mm drum (#PCA-1100) which increases speed to 18 meters per minute. Use Any Length of Rope! 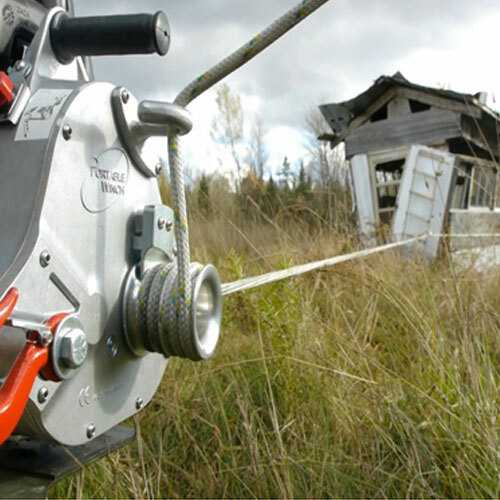 The PCW5000 portable capstan winch should be used with 1/2" Double Braid Polyester Rope #PCA-1215M. If you need more than 164 ft for a longer pull distance, we do offer 1/2" Double Braid Polyester Rope in Bulk, where you can order up to 600 ft on one spool, giving you a tremendous combination of reach and pulling power. You can also use this rope with pulleys and anchor straps to increase or redirect line pull. * Rope and accessories sold separately. What is the biggest rope diameter you may use? Although 1/2" is the suggested rope diameter, you may use up to 5/8" rope, however there may not be much benefit to up-sizing. Can the pulling force be doubled with a block and tackle? You certainly can use pulleys to redirect your line pull or increase your pulling capacity. Exactly how much you gain will depend on how you rig up the system. It might be helpful to visit the 4" Pulley Page and watch the video there which covers the various pulleys offered, and how to use them. 1) Can I mount it on a base plate? 2) The weight of the unit? 3) I assume it runs on petrol (gas) and not diesel...? 4) What is the noise output in decibels? Please see your answers below. 1) Yes, please see either the #POR-PCA-1261 or the #POR-PCA-1268. 2) The winch itself weighs 35.3 lbs. 3) Yes, it runs on gas. 4) 93 dB, and there is a sticker on the unit to indicate this. I used it to pull a 42 inch bull moose 300 yards across a river twice, took me and my son one and a half hrs, was wonderful, easiest drag I ever had. 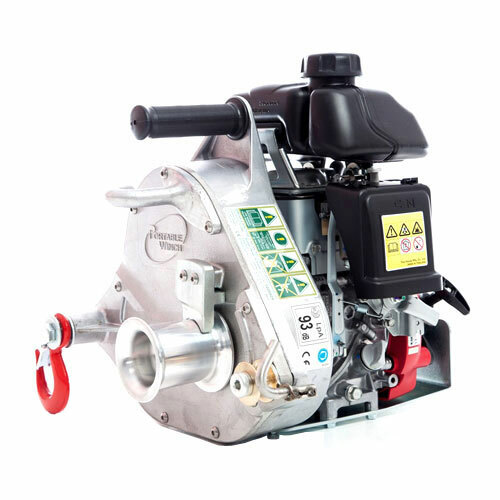 This small gas powered winch packs a lot of punch in a small package. It is well made with quality materials. Starts easy and is simple to use.